Sit down, may I pour you a cup? Caroline and Pat collaborated on Sorcery and Cecilia, a book they wanted to call The Enchanted Chocolate Pot. The book has been described as “Jane Austen and Georgette Heyer have J.R.R. Tolkien to tea–or chocolate.” A Regency Romance, with Magic. Pat also wrote a couple of novels, Maerelon the Magician, and The Magician’s Ward, set in a similar world–I used to think that these were actual sequels, based upon a report I’d seen online, but Pat told me a couple of years ago that this impression is incorrect. However, an actual sequel, written by both Pat and Caroline, The Grand Tour, appeared in fall 2004. Another sequel, The Mislaid Magician, is forthcoming in November, 2006. SATURDAY, NOVEMBER 18TH, 3:00PM PATRICIA C. WREDE AND CAROLINE STEVERMER will be here. We’ll be having a tea party to celebrate the release of their new fantasy novel THE MISLAID MAGICIAN OR TEN YEARS AFTER, featuring Kate and Cecy in an alternate, magical Regency England. Pat and Caroline will be reading, answering questions, and signing books.FFI about the event: dream@dreamhavenbooks.com or call 612-823-6161. 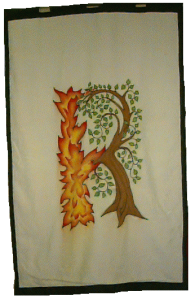 If you cannot attend and would like to order signed copies of their books, visit our website http://dreamhavenbooks.com/wrede-stevermer.php or call our mail order department at 612-823-6070 (11:00am – 7:00pm Weekdays, 1:00pm – 6:00pm Saturday, central time). “Uncle Bob Visits” (the story I read [in December of 2004 to the Rivendell Group]) sold to Viking’s COYOTE ROAD anthology, but the anthology has been rescheduled for the Far Future. I definitely think reading it to Rivendell folk was good luck. Notes from Caroline & Pat. Yes, this is a selection from the Science Fiction Book Club. It’s an omnibus edition of Sorcery & Cecelia and The Grand Tour. I haven’t actually seen a copy yet myself. I was reading Sorcery & Cecelia when I flipped to the back and I saw that both of the authors lived in Minneapolis! I live in Grand Forks, ND not to far away from the Twin Cities so I thought I might be able to check out one of their book signings or see them at a convention. So I googled her name and found your site. And I’m sorry to say that I didn’t see that they would be attending any soon! Are they just busy with other things at the moment? Because I’d really like to see them at a con sometime, Valleycon, or another local con. Nothing definite for the immediate future; I usually get to Minicon, sometimes to Wiscon, Worldcon, or World Fantasy (but none of the above this year, due to schedule conflicts). The TV Bookshelf Pat Wrede interview is now online (actually has been for a week or so). As for Stevermer news, you have to check out writer Sherwood Smith’s observations about her current reading on her website, http://sherwoodsmith.net/, check out her entry for Feb. 5, 2005. Here is another Pat Wrede interview, already online! 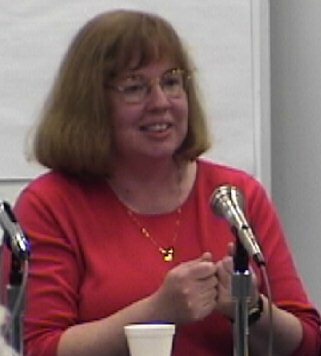 Just in case you don’t already know, the February 2005 Fast Forward interview (available in Quicktime on our website – www.fast-forward.tv) is with Patricia Wrede. She talks quite a bit about the experience of collaborating with Caroline Stevermer during the interview. As of today (Valentine’s Day) we have the Stevermer interview online at the TV Bookshelf site. We hope to have the Pat Wrede interview up within a couple of weeks! Incidentally, Peg Kerr credits Pat with mentoring her work in the interview she has online at TV Bookshelf. Lois McMaster Bujold also cites Pat as an influence and support on her work. These interviews are also being broadcast on various cable channels in the Twin Cities area. Both Caroline and Pat have recently been interviewed on Joan Marie Verba’s cable access television program, TV Bookshelf, http://tvbookshelf.com/. By the way, both The Grand Tour and A Scholar of Magics DID duly appear in hardcover, Scholar this spring, and Tour in September. I am posting a couple of pix of Caroline from last fall’s World Fantasy Convention. One shows her with a college classmate: author, editor and public radio personality Ellen Kushner (author of Swordspoint, Thomas the Rhymer, and The Fall of Kings). Unfortunately, the lighting was too poor to give me very good photographs. But at least on my monitor, the blurry background lights and dimness give them something of a mysterious patina–like old sepia photographs. I finally had time to read A Scholar of Magics, and after six months of reading all kinds of finalists (and earlier nominees) for the Mythopoeic Awards this year, Caroline’s new book was a total delight: clever, funny, fun but also substantial and intelligent. Run out and buy it, or at least request it at your public library! 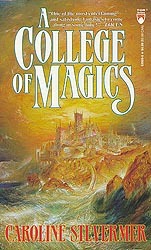 A Scholar of Magics is scheduled for publication in April 2004. Sorcery & Cecelia has been named to the ALA’s general list of Best Books for Young Adults. SCHOLARLY MAGICS (an omnibus edition of A College of Magics and A Scholar of Magics) will be the Science Fiction Book Club’s featured alternate selection for Spring 2004. December and they were already working on the cover, so I have high hopes. I saw the new Sorcery & Cecelia edition in a bookstore (Barnes & Noble)! Clearly, it’s being marketed to Young Adults, while the past edition was marketed to the adult market. I’ll try to gt a picture up soon. Finally, you can buy your own copy! And, it has the “or The Enchanted Chocolate Pot” subtitle on the cover! 12/20/01. Caroline and I have just made a deal with Harcourt to reissue SORCERY AND CECELIA, probably in hardcover, spring 2003, followed by a sequel (tentatively titled THE GRAND TOUR), six to twelve months later. I’m told we’ll see contracts sometime in January, so I think you can add it to your news, if you want. 11/11/02 update [from David, not Pat]: plans continue for this reissue. Pat and Caroline are making progress with the manuscript of The Grand Tour. It will not be a letter game this time. One character keeps a journal, one is being deposed [ for a trial (?)]. Both Pat and Caroline read at World Fantasy Convention a week ago. I was sorry to have missed Pat’s reading, but pleased to hear a delightful chapter of A Scholar of Magics from Caroline. 1908: somewhere on the Normandy coast, a private university dominates a little village perched on a cliff. Officially, this school for young girls specializes in the teaching of magic. Paradoxically, the subject is only approached indirectly, in a master course on the balance of the universe. Furthermore, the students are forbidden to practice magic in college bounds, and there is no course on magic, per se. Strange. . . .
A College of Magics follows the school-life of the young Faris Nallaneen, hereditary duchess of Galazon, a minute kingdom in Central Europe, in the company of her friends and of a rival, daughter of the ruling family of a neighboring kingdom. The dialogue is absolutely delicious, the setting evoked with vigor and realism. A mysterious person watches discreetly over the security of Faris –even though he says that he’s in her uncle’s service, the uncle whom Faris suspects of wanting to get rid of her so that he himself can control the duchy. At the end of the night of her initiation to magic, Faris is expelled from the college, and recalled suddenly to her duchy by her uncle. There follows a lively journey on the Orient-Express through Europe at the beginning of the century, from Paris to the borders of Ruritania dogged by killers. Once at Galazon, there are court intrigues and swashbuckling fights. . . With contagious delight, this novel recaptures such a flavor of The Prisoner of Zenda, that Anthony Hope’s ingenious adventure novel seems nothing more than a simple historical novel about a neighboring country. Fresh, unexpected, A College of Magics is a complete joy from one end to the other. The great strength of the author is in the dialogue, but the architecture of the plot is the work of a masterhand, the situations and the reversals twist satisfactorily, the swashbuckling is frankly entertaining, the magic scenes are poetic, humor and drama coexist happily. . . In short, a little-known masterpiece, delicious precursor of J.K. Rowling’s Harry Potter. Caroline Stevermer grew up on a dairy farm in southeastern Minnesota. She has a sister and two brothers. After high school, she attended Bryn Mawr College in Pennsylvania, where she earned a B.A. degree in the history of art and read everything she could get her hands on. She knew she wanted to be a writer when she was eight years old. She began by writing dreadful stories in her school notebooks. By the time she graduated from college, she knew she would need to earn money in other ways but she kept on writing. Her first professional sale was The Alchemist: Death of a Borgia, a paperback mystery published by Ace in 1980. In the years since, she has had a variety of jobs and kept on writing. She likes libraries and museums. Her favorite painter is Nicholas Hilliard. Her favorite writer is Mark Twain. She lives in Minnesota. I’m working on Scholar of Magics right now, hoping to deliver an acceptable manuscript by the end of the month. It is related to College of Magics even though the cast is different. (One character, Jane Brailsford, recurs.) Nothing else right now, though I’m thrilled about working with Harcourt again for Sorcery and Cecilia and the sequel (see news from Pat, above). I wrote to Pat: I seem to get a lot of requests from school children for biographical information about writers on my web-pages, do you have a standard autobiographical sketch or note that I could forward to any such inquirers? letter-writing campaign to a publishing house to get this book reprinted? What are the possibilities. Well, if no one wants to reprint it, Pat and Caroline might be able to get it reprinted by an “on-demand” publisher. In the meantime, I just read Caroline’s new book, When the King Comes Home (or some such title) last night and very much enjoyed it! My daughter and I also heard Pat read from a work-in-progress that we quite enjoyed earlier this year, but that’s probably a couple of years away from publication (alas!). But as for Sorcery and Cecilia, are the rights still with Ace? After an even longer time, P.C. Hodgell’s first two Jame books are finally reprinted (as Dark of the Gods) this year. I would think with both Pat and Caroline publishing books that there would be interest in reprinting the book, though. I wonder if some kind of SF Book Club omnibus volume of S & C along with the Maerelon books might be possible? On checking, I learned that there IS already a omnibus volume of the Maerelon novels, sans Sorcery and Cecilia, so I suppose that’s not going to happen. December 2001. When the King Comes Home is out in mass market paperback. Peg Kerr, author of the VOYA-reviewed novels Emerald House Rising and The Wild Swans. Peg has also taught at the University of Minnesota. Caroline Stevermer, author of River Rats and several other novels, including her latest book, When the King Comes Home. [Pictured at left. To see a photo of the panel, visit the Once Upon a Time page]. Society (Minn-Stf).10/26/00. Yesterday I read When the King Comes Home cover to cover! I really enjoyed it! Now in bookstores, clearly, as I bought my copy in one on Tuesday.–David L.
The February 2000 Einblatt reports that Caroline has now delivered her completed manuscript for When the King Comes Home to Tor. Caroline was photographed at Minicon in 1999. 3/25/00. Recently, my daughter and I attended a reading by Patricia C. Wrede from a novel-in-progress about a world in which there are many shape-shifters, including the apparent protagonist, a teen-ager beginning to undergo her first change in the excerpt which Pat read. Pat said that this is the first of a “triptych, not a trilogy” of novels, which have to be written partly simultaneously as they provide differentperspectives on some of the same events from different characters. Claire and I very much enjoyed the story, and hope that Pat will be able to finish and sell it, soon. 12/15. Pat will be signing at Uncle Hugo’s. The new Enchanted Chocolate Pot book, The Magician’s Ward! Stressed out at work? Looking for a pleasant diversion? Mairelon the Magician is sheer entertainment. Patricia Wrede plops us back into the Regency England she and Caroline Stevermer introduced in Sorcery and Cecilia. In Wrede’s Britain, magic is real and the Royal College of Wizards wields power other than political. Teenaged Kim is an orphan living by her wits and somewhat dubious set of skills. She poses as a boy to avoid a life of prostitution, but obviously this is not a charade she can keep up forever. How fortunate for her, then, that after being caught illegally snooping around she is not turned over to the police but is given a chance to follow and assist the traveling Mairelon. Kim becomes caught up in the mystery of searching for the still-missing pieces of a stolen magical silver serving set. As Mairelon was the theft’s prime suspect, this search can not be done openly. What unfolds is a delightful drawing room farce, as Mairelon and Kim find that are not the only ones searching for the sorcerous silver. Wrede pays hommage to the scene in Mozart’s The Marriage of Figaro in which numerous people enter a room, only to hide from others heard approaching. It’s a common trick in farce, but Wrede writes it so it is fresh and funny. She even reprises it, in a way, at the climax of the book, and it is just as witty. Mairelon the Magician is a pleasant light fantasy, the perfect sort of book to take into the bubble bath or the dentist’s office. You’ll find no heavy message or hidden agenda–just good old-fashioned fun. 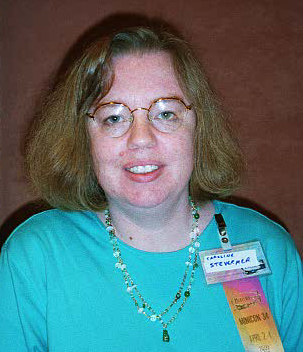 Left to right: Caroline is pictured on a panel discussion at Minicon 1999 along with a panelist I don’t recognize, (I believe he is an editor and writer), Lois McMaster Bujold and Steve Brust. The Alchemist, as C. J. Stevermer. Ace Charter books, 1980, mass market paperback. The Duke and the Veil, as C. J. Stevermer. Ace Charter books, 1981, mass market paperback. “Cenedwine Brocade” in the shared-world anthology Liavek: Wizards’ Row, Will Shetterly and Emma Bull, editors, Ace Books, 1987, mass market paperback. The Serpent’s Egg, Ace Books, 1988, mass market paperback. Sorcery and Cecilia, (Collaboration with Patricia C. Wrede) Ace books, 1988, mass market paperback. River Rats, Harcourt Brace, Spring, 1992, hardcover; Magic Carpet Books, mass market paperback, 1996. “Waiting for Harry,” in All Hallows’ Eve, Mary Elizabeth Allen, editor. Walker, 1992, hardcover. “The Springfield Swans,” (Collaboration with Ryan Edmonds), in Snow White, Blood Red, Terri Windling and Ellen Datlow, editors. William Morrow, 1993, hardcover; Avon books, mass market paperback. A College of Magics, Tor Books, hardcover, Spring, 1994; mass -market paperback, January, 1995. “Watching the bobolinks,” in The Armless Maiden, Terri Windling, editor. Tor Books, April, 1995. When the King Comes Home, Tor Books, hardcover, Fall, 2000. A Scholar of Magics, Tor Books, hardcover, Summer, 2004. The Grand Tour, (Collaboration with Patricia C. Wrede) Ace Books, 2004.